Do you find yourself being overwhelmed at the office and can’t seem to get that one task done? Here’s how I tackled that challenge by planning my day! At the start of the new year I had many goals I wanted to accomplish professionally and personally. When listing them out, it seemed like a daunting task. How would I ever accomplish any of these goals? After giving the goals a deep review I found that many were impacted by one simple cause, my lack of planning. After some thought, dusting off old work time management books, and testing, I’ve come upon the perfect formula that works for me. Here’s what I did. I cannot express how important this is. If you do anything, DO THIS! What is “The Power Hour?” you ask? This is one hour blocked off on your calendar where you take on your most important items for the day. It could be sending that one email you’ve been meaning to send or updating that spreadsheet that you can’t seem to get the time for. Literally, anything! If you arrive in the office before everyone else, this would be the best time to schedule a power hour. Most people find that they are the most productive in the morning and it is this opportune time for you to get the most important tasks done and out-of-the-way! If you are someone who comes in much later, maybe try switching your power hour to everyone’s lunch hour, or when most leave the office for the day. This will help reduce any interruptions you may face. How do I execute the power hour? Block your first hour of the day on your calendar. Make it a recurring appointment. Write a post it note with your power hour task or if you have great will power, update your appointment slot on your calendar with that task and follow step two very closely! DO NOT READ EMAIL! If your power hour is in the morning, avoid reading your email at all costs. For a lot of us, email has the ability to define our day and we begin to use our email as our to-do list. Soon we find our day buried in walk-ups, calls, instant messages and that one item we needed to get done, doesn’t get the attention it deserves. The only exception to this rule is IF email IS your power hour task! Stay with it! Always put tasks in your power hour and if you find that you need to shorten the power hour to thirty minutes or make it two hours, go for it! The point is blocking this time to accomplish your top items before letting the day take hold. To help me stay out of my email inbox, I schedule three recurring appointments in the day where I check email. They are usually scheduled in the morning after power hour, around lunch and at the end of the day. This reinforces that email is not my to-do list. A bonus tip here is to disable any pop-up notifications that you may receive from email. You may even go so far as to close your email application so that you are not tempted. Another method I deploy is scheduling my to-do’s. I carve out sections of my day and dedicate it to various support or project items. I am a technical lead so my work revolves around taking care of my developers, performing support work, and performing project work. Your project tasks are usually defined and assigned out, and your support tickets come in at their own leisure. 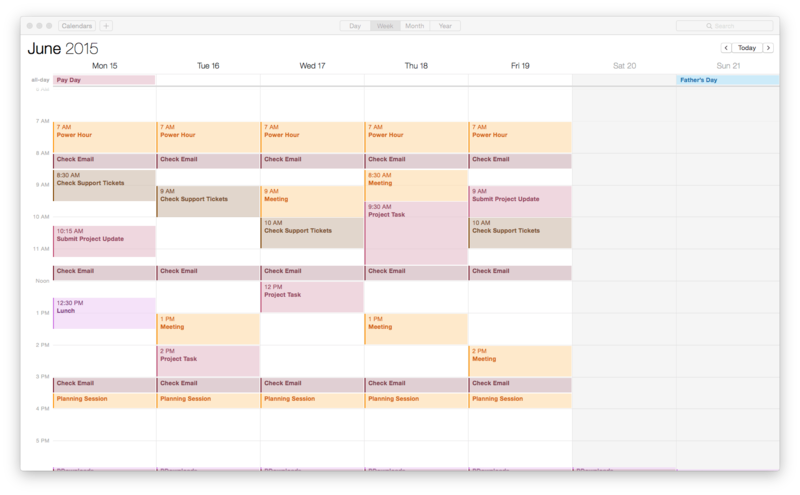 Block time off on your calendar to review your support tickets in addition to blocking off your time to perform project tasks. The time can be blocked off as “busy” if it is an item or task with a set deadline, or you can mark yourself as available, so that others can schedule meetings. A side benefit of scheduling your to-do’s is that if you are tracking your time, you can look at your calendar and find the items you were working on. The last appointment slot of the day is a planning session. This is the last thirty minutes of my day where I review what I accomplished and then determine what tasks I want to work on the next day as well as the power hour agenda. NEVER skip this. Always know what your next day in the office looks like. There could be that one person who decided to schedule an 7am meeting when you normally come in at 8am. Doing this simply re-enforces your power hour as you will know what your day will look like before you get in, and you can stay ahead of it by building a guideline to follow. Color code your calendar entries. Outlook and Gmail have the option to color code calendar items. In Outlook I’ve added categories that I tag emails with as well as calendar appointments. This will definitely help you recognize calendar entries when planning. As always, things change. You can never plan the perfect day, but you can give it a great outline to follow. Feel free to move items around on your calendar as things come up. Be dynamic and don’t feel that you are locked in to what you planned to do. If things change, you’ll find that you were better off because you can now allocate that new time slot to something else. Hopefully these tips help you be a little bit more successful in the workplace as they have for me. Remember, small steps make a big change so take yours today and let me know how it goes!